After several years of behind-the-scene negotiations, the partners in the International Space Station, ISS, project are quietly putting the finishing touches on a grand plan to extend human presence beyond the Earth's orbit for the first time since 1972 and to establish a pioneering long-term outpost in the vicinity of the Moon, known as Deep Space Gateway, DSG. If this effort manages to overcome all the financial, political and technical hurdles, it might lead to even more ambitious human undertakings in deep space, including a return to the Moon, visits to asteroids and, ultimately, an expedition to Mars! This page is designed to serve as a starting point for our exclusive unofficial coverage and visualization of the project in the coming years. The concept of an orbital station around the Moon appeared in early American and Soviet studies of lunar exploration. Around 1959, Wernher von Braun envisioned the refueling of transport ships in the lunar orbit. In 1962, Sergei Korolev, the founder of the Soviet space program, considered long-duration "satellite-stations" in lunar orbit to support deep-space expeditions. Although at the beginning of the 2010s, NASA proclaimed an expedition to Mars as the ultimate goal of its human space flight program, the US agency agreed with its ISS partners that the road to the Red Planet would go through an outpost in the cis-lunar space. During 2017, the concept of the cis-lunar station made major strides toward leaving a drawing board. In October, US Vice President Mike Pence seemingly came very close to endorsing the project in a major space policy announcement. In 2018, five space agencies continued active negotiations on the design of the near-lunar outpost. At the beginning of the year, the launch of the first piece of the station, the Power and Propulsion Element, PPE, was shifted from NASA's giant SLS rocket to a smaller commercial vehicle and, by April, the second habitation module was reinstated in the outpost's architecture. In February 2019, the international effort to develop a habitable outpost in orbit around the Moon passed a significant engineering review, but Roskosmos was the only member of the development team not to sign off on the completed work. In 2011, the US embarked on the full-scale development of the super heavy booster dubbed the Space Launch System, SLS. The giant rocket would be powerful enough to send around 10 tons of extra cargo along with the Orion crew vehicle beyond the Earth's orbit. As result, each Orion mission could carry a building block of the future outpost to the lunar orbit. Initially, for NASA, the main goal of the near-lunar station was not the Moon but Mars. For example, the station could perform endurance tests of a closed-loop life-support system needed for missions to the Red Planet and asteroids. New radiation protection and propulsion systems could also be tried. However NASA's partners wanted to use the outpost to explore the Moon itself. After considering Lagrangian points, engineers chose the Near-Rectilinear Halo Orbit, NRHO, around the Moon for the cis-lunar station. It will keep the outpost always in view of mission control on Earth and beyond the Moon's shadow. During each revolution lasting less than a week, the station will come as close as 1,500 kilometers to the Moon and fly around 70,000 kilometers from the lunar surface at its farthest point. During the Formulation Sync Review, FSR, in September 2018, NASA detailed a possible budget for the cis-lunar station and its major components. According to NASA, the gateway in the lunar orbit would be implementable under the agency's current budget. Refueling operations will be critically important for maintaining a human outpost in the lunar orbit. However, in addition to the high cost of delivering propellant to the vicinity of the Moon, refueling will be complicated by the need to develop an entirely new system to transfer and store liquid xenon for the outpost's innovative electric engines, along with the traditional hypergolic propellant. The cis-lunar station program involves an extremely complex network of organizations including space agencies, contractors and scientific teams around the world, which all have to work in sync on multiple aspects and components of the project over many years. To manage their interdependent activities, NASA formed a special Schedule Working Group, SWG, tasked with compiling and updating the project's schedule. Although in 2017, NASA and its partners agreed that the cis-lunar station would be "parked" in a giant egg-shape orbit known as the Near-Rectilinear Halo Orbit, NRHO, it was always assumed that the outpost could still make occasional sorties to other interesting destinations in the vicinity of the Moon. In 2018, specialists continued defining possible scenarios for possible journeys around the Moon. Specialists working on the project of the cis-lunar station are completing the analysis of potential upgrades aimed to boost the reliability of rendezvous and docking operations between the Orion spacecraft and the components of the future outpost in the lunar orbit. The assembly of the human outpost in lunar orbit will begin with the Power and Propulsion Element, responsible for the maneuvering, power and communications on the future habitat. A dramatic re-write of the assembly schedule for the Deep Space Gateway at the beginning of 2017 has put severe mass restrictions on the first component of the cis-lunar outpost. To resolve the problem, European engineers proposed a newly designed robotic vehicle to take over some of the tasks of the original Power and Propulsion Bus. Capitalizing on its extensive experience in the Space Shuttle and the ISS programs, the Canadian Space Agency promised to provide a sophisticated robotic arm for the cis-lunar base. The device was expected to ride into space, strapped to the very first piece of the outpost -- the propulsion module. During negotiations in Houston in April 2018, NASA proposed the new assembly scenario for the Lunar Orbital Platform - Gateway, LOP-G, program, which brought back the second habitation module into the architecture of the station, almost a year after only a single habitat was left in the design. The "revived" element was now dubbed "Utilization Module" and was provisionally scheduled for launch in 2023. From the outset of the project, the partners agreed to build at least two habitation modules for the crew of the cis-lunar outpost. Not surprisingly, the European Space Agency, ESA, took responsibility to provide the modules, based on Europe's experience in the Columbus and Spacelab programs. In May 2018, NASA added another US-built habitation module to the project of the Lunar Orbital Platform, LOP-G. It was identified as the Domestic Habitation Module, or D-Hab, and penciled for launch no earlier than 2025 on the SLS rocket along with the Orion spacecraft. Not counting logistical components, D-Hab would be the third pressurized piece of the near-lunar outpost. By June 2016, Russia limited its role in the cis-lunar project to an airlock module, whose concept was formulated at the nation's key human space flight contractor, RKK Energia, by October of the same year. During its flight to the lunar vicinity either on NASA's SLS or on Russia's own Angara-5/KVTK rocket, the module would double as a cargo vehicle. It could also host the US space suits along with the Russian Orlans. In the second phase of the assembly at the end of the 2020s, NASA hopes to equip the cis-lunar platform with a bigger better habitation and propulsion module, which would be capable of deep-space missions, possibly even to the vicinity of Mars. It will generate up to 150 kilowatts of power and feature the latest electric propulsion system. The cis-lunar outpost is also expected to serve as a home and, possibly, a mission control center for a robotic lunar lander designed to collect and return soil samples from the surface of the Moon. As of 2016, European, Japanese and Canadian space agencies hoped to pool funding to build the rover-carrying unmanned platform for the project, known as the Human Lunar Exploration Precursor Program, HLEPP. The Russian political decision in the summer of 2017 to participate in the development of the DSG project, prompted engineers to consider again possible Russian contributions to the project. One concept prepared for the Checkpoint Review meeting in October 2017 included a Lunar Mission Support Module. NASA and Roskosmos have made the first step to integrate a prospective American spacesuit with the Russian module serving as an airlock aboard the Lunar Orbital Platform, LOP-G. The science airlock will allow the crew to take experiments and other payloads from the short-sleeve environment of the Deep Space Gateway to the vacuum of space in the vicinity of the Moon. It could also serve as an entry point for containers with precious soil samples delivered by robotic vehicles from the surface of the Moon to the lunar orbit. Last but not least, during long expeditions aboard the near-lunar gateway, the crew could use the science airlock to dispose of trash. The first and only vehicle capable of delivering astronauts to the outpost (at least initially) will be NASA's Orion spacecraft launched on the giant SLS rocket. Most of the station's components will hitchhike to the lunar vicinity along with the Orion. By the time, it carries its first crew, NASA will have spent nearly two decades for the Orion's development. As of 2016, Roskosmos promised that its new-generation transport spacecraft, PTK NP/Federatsiya will have a rocket large enough to send it beyond the low Earth orbit around 2027. If ever built, the PTK will provide an alternative to the Orion for astronauts and cosmonauts to reach the cis-lunar base. Various concepts of unmanned vehicles carrying cargo to the cis-lunar outpost have been under consideration in the past couple of years. Cargo flights would be required to extend the presence of the crews on the outpost beyond the few days afforded by the life-support system of the manned spacecraft. The Logistics Augmentation Module, LAM, was conceived to be the first cargo supply mission launched toward the near-lunar station on an expendable commercial rocket. Overall, it would be the third flight to assemble and maintain the human outpost in the vicinity of the Moon. In 2018, the Japanese space agency, JAXA, formulated an early concept of a robotic vehicle intended for a one-time re-supply of the cis-lunar station. The spacecraft would be propelled to its destination on a SpaceX' Falcon Heavy rocket. 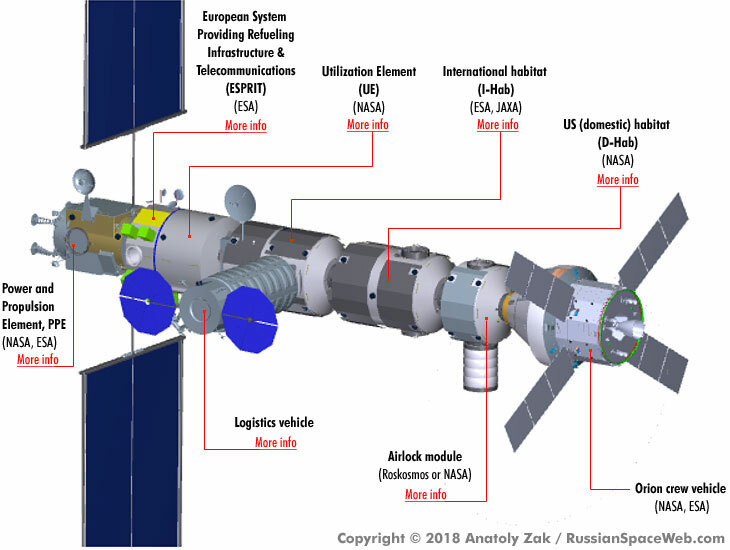 In 2019, in the latest round of assessment of possible contributions to the international lunar gateway, Russian engineers mulled a specialized version of cargo ship which could reach the outpost by way of a domestically built rocket. At the beginning of 2019, Roskosmos leadership looked at possible engineering ideas which could allow the fast development of a new transport system to the lunar orbit. One concept, which caught attention of Roskosmos head Dmitry Rogozin, relied on an aerodynamic heat-shield to ease the spacecraft into the Earth's orbit without use of propellant in a method known as aerobraking. NASA's super-heavy rocket known as the Space Launch System or SLS was approved for development in 2011 and it is promised to be ready for the first test launch at the end of 2019. SLS derived from the Ares-5 rocket, first envisioned around 2003. In 2016, the Russian space officials concluded that a super-heavy launcher would be the only efficient way for carrying crews to the Moon. However, with all the economic problems facing the Russian economy, the big rocket is not expected to appear on the scene until the late 2020s. Although the key mission for the Angara-5V rocket would be to compete on the commercial market and deliver the heaviest military payloads, the rocket could fins some role in human missions beyond the Earth's orbit. As many as four Angara-5Vs would be required to put a crew on the lunar surface with the use of the 20-ton next-generation PTK NP spacecraft and a separately launched lander.